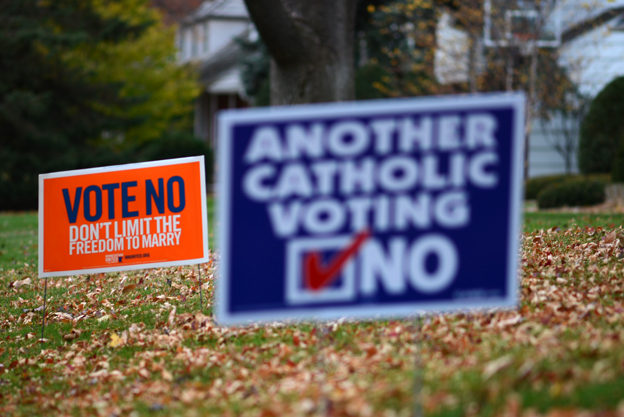 Did the Marriage amendment deliver the suburbs to the DFL? With the DFL winning back both chambers of the Minnesota Legislature, due largely to their strength in the suburbs, the question has been asked (and was being asked before the election too), did the Marriage amendment help to deliver the suburbs to the DFL? 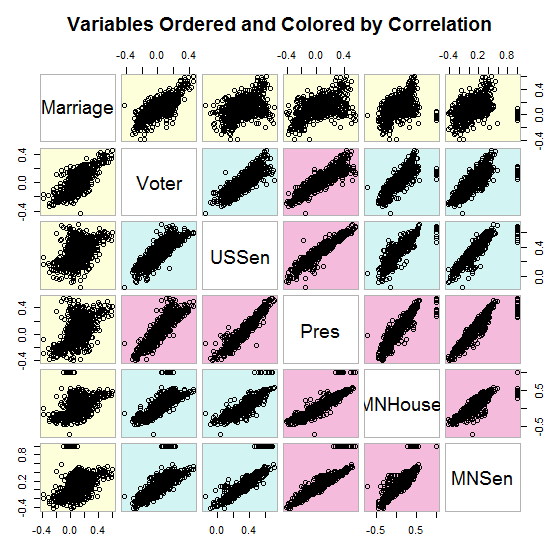 I’m going to explore that idea a bit in this post, by way of comparing the correlations of the four state wide races as well as the aggregate vote for Minnesota Senate and House. The following chart might be a bit much at first, but don’t worry, there’s going to be more of them! What you’re looking at is a correlation matrix. Diagonally down the center are the different races. 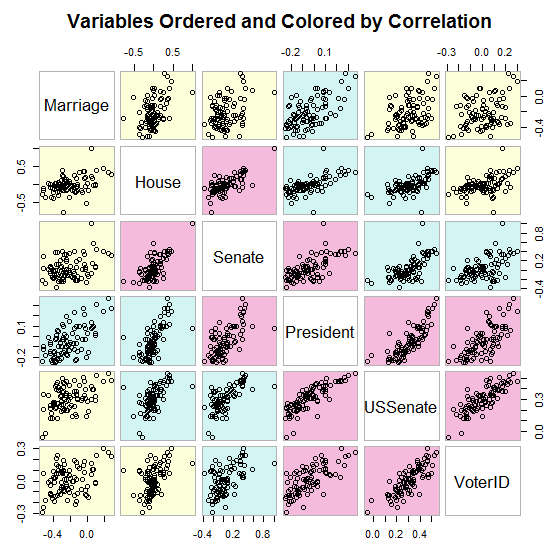 To see how two races correlate with each other find where the two variables intersect. The way the matrix is arranged, the variables that have strong correlations with one another are grouped together, and shaded in red. The variables that have weak correlations are at the edges and shaded in yellow. What you can see is that the Marriage amendment doesn’t really correlate that well with any of the other races. It’s strongest correlation is in fact with the Presidential race, but that’s also the race that correlates most strongly with everything. 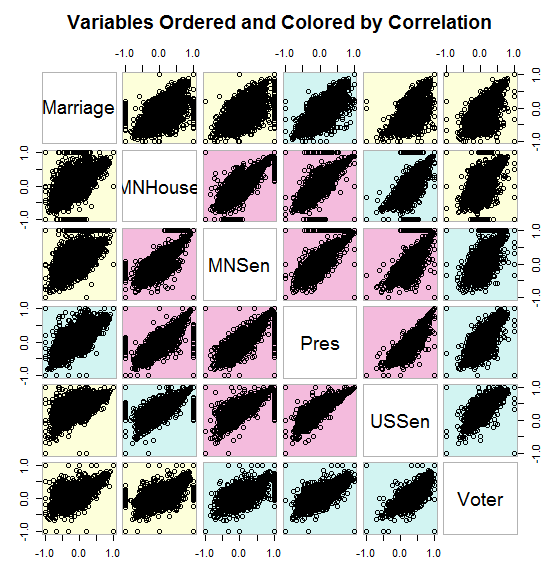 This type of by county analysis might be missing a more granular relationship that exists at the precinct level though, so let’s go a little deeper and look at the vote by precinct. Once again, the Marriage amendment doesn’t have nearly as strong a relationship to the Minnesota House and Senate race results as the Presidential numbers do. The argument is that the Marriage amendment helped DFLers win in the suburbs though, not necessarily in the rest of the state. To try and isolate the suburbs, I’ll just look at the precincts in the inner ring suburban counties; Anoka, Dakota, Hennepin (minus Minneapolis), Ramsey (minus St. Paul) and Washington. By isolating the suburbs what becomes clear is that it wasn’t the Marriage amendment that caused so many seats to flip. The variance in the Marriage amendment vote only explains about 10% of the variance in the legislative vote. The variance in the Presidential vote however, explains 80% of the variance in suburban votes for the Minnesota legislature. It wasn’t the Marriage amendment that delivered suburban Minnesota to the DFL; it was the presence of Barack Obama at the top of the ticket that did it. What does Mike Trout have to do with the Marriage Amendment?